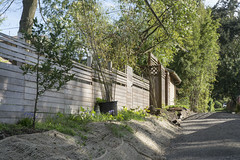 We are a group of urban planners and activists who volunteer our knowledge and skills to work with community groups, City staff and Portland State University students to reimagine the underutilized and often unimproved residential alleys in the Portland Metro area. At present, we supporting a number of projects in Portland. 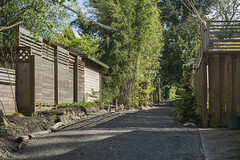 During the winter and spring of 2013, the team conducted an engagement process that incorporated residents’ values and priorities related to alley space in the community. The group was then known as Mill Street Community Planning. This phase of the project resulted in three products: A Plan, a Background Report, and a Toolkit to aid residents in building their own alley projects. Since the summer of 2013 the team has been supporting community groups and non-profits undertaking the first round of alley projects including providing guidance on funding strategies, public outreach, design concepts and working with City staff on permitting. We welcome inquiries and ideas for further projects throughout the Portland Metro area and in other cities. Click here to send an email to the Team. I make presentations and blog for Mother Earth News, live in Eugene. Can you please tell me what is the status of Alley Allies? Is Portland devoting staff time to this? 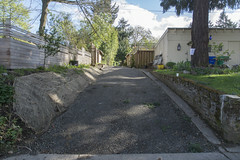 Are there active alley reclamation projects? Do you know of alley ally projects in other cities? Do you work with City Repair? Awesome idea. What is current? I am involved with suburban permaculture here. Have been transforming my 1/4 acre suburban property for 15 years. We have a number of similar projects in the nearby neighborhood and are consciously advocating these transformations. Our neighborhood hosted the 2015 Northwest Permaculture Convergence this past August. Check my web site for extensive documentation of my place, the neighborhood and convergence. I would also be very interested to talk with anyone on the phone/skype about AA, suburban permaculture and creating more green and resilient neighborhoods and communities. Also open to doing an on line presentation for those interested at PSU.